In spite of the fact it is now properly chilly outside and a linen top won't be especially useful until next spring, I have been plugging away at the blue linen timetable I started way back in May. 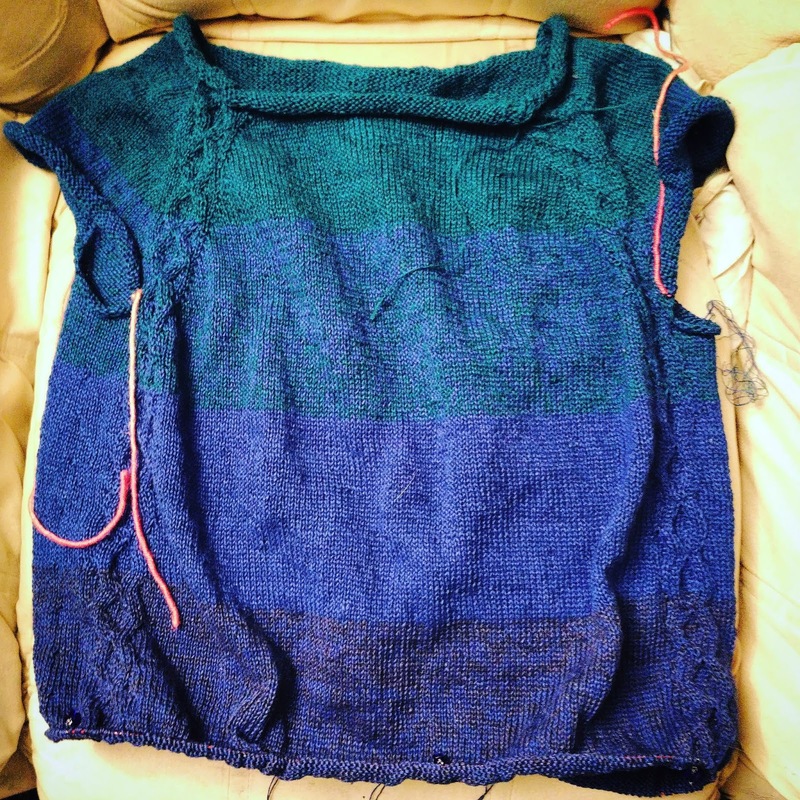 I've got a bit of a problem, really: I need to set it aside to rest, partly because I'm not enjoying it (and therefore not knitting very much) and partly because I think I'm going to run out of the darkest blue yarn before my plan comes off. But it's chiefly for that second reason that I am doggedly continuing: if I run out I can make plans to buy another skein at Wonderwool next year. Also, this represents 2000m of yarn towards this year's total and if I don't finish, I will have no hope of surpassing last year's total. This shouldn't be important but it is. Half term is in two weeks. Traditionally, October half terms spent at home result in a finished sweater, due to the amount of hibernating and TV watching that needs to happen in that week; so I am going to give myself two weeks to get the body of this one done and then at half term I will cast on something fresh. Whether the linen is finished after that will depend on yarn remains and how much there is left to do.